Are you planning to broaden your horizons by choosing to study Abroad? Looking forward to build a global network of friends and wish to stand apart from crowd? Well, if you have strongly willed to pursue your higher studies abroad, it can be an arduous task to decide where to begin. Right! Don’t be anxious! Go through the comprehensive list of ideal study overseas destinations that are being listed below to build your bright career and to hit the stupendous hotspots of cosmopolitan cities, adventurous provinces, rich and vibrant cultures as well as stunning landscapes. How to Pick a Best Country to Study Abroad? 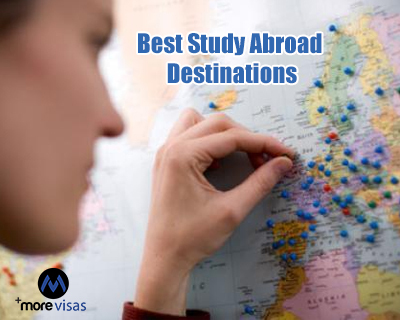 Determining a best study abroad destination is not only an exciting task but also challenging too. To figure out the best overseas study destination that suits you best, first and foremost list out the key factors that you consider it to be important. Few of the factors are popular study abroad programs and courses that they offer, standard of education, quality of living, social experiences, work while studying opportunities, affordable housing facilities, crime rate and the career as well as employment prospects that they offer after the successful completion of graduation. United Kingdom: UK has many renowned and prestigious institutions, colleges and universities that offer globally recognized study abroad programs that would be helpful for a prospective student to come up in flying colors at a faster pace. Few of the well-known institutions to study in UK are University of Cambridge, Durham University, University of Glasgow, University of Edinburgh and many others. Obtain the UK student visa to fulfill your career aspirations at the earliest. France: This is one of the incredibly popular study destinations wherein brilliant mathematicians and scientists were born. Undertaking quality higher education and living in tranquil ambience is like gaining a great experience to grow yourself personally, professionally and academically. Germany: This world-class destination is recognized as a most friendly and welcoming study destination for international students, and it offer’s globally accepted degrees in diverse fields and courses at affordable rates. Leading a quality life here is very inexpensive, as the tuition fees that is being charged by their executives is similar to that of the fee charged for local students. An international student willing to pursue his or her higher studies in this beautiful destination must obtain the Germany student visa to benefit from the career and job prospects provided by them. Australia: This happiest and prosperous nation has a renowned university called Australian National University which offers standard education in diverse courses such as art and design, information technology, engineering and many others to grab the job opportunity soon. There are many reasons to study in Australia such as ability to meet complex situations, can attain bursaries and can improve language skills. An international student must obtain Australian student visa to pursue their higher studies effortlessly. Apart from the aforesaid destinations there are many top-notch overseas study locations such as USA, Ireland, Sweden, Austria, Norway and many others. Overseas students willing to come across vibrant cultures and ample number of universities and institutions to undertake standard overseas higher education can prefer to study in USA to build their bright career at the earliest. Mulling on to move to overseas for higher studies? Look no further; obtain the student visa of your dream destination by approaching the dedicated and focused professionals of MoreVisas by filling out our Enquiry Form.